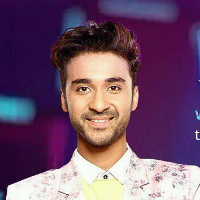 Raghav Juyal is an Indian Dancer, Choreographer, Anchor and Actor. He is renowned as the King of Slow Motion for his surreal dance moves in slow motion style and for his reinvention of the Slow Motion Walk. His stage name Crockroaxz describes his dancing style which is an amalgamation of being powerful like a crocodile and creepy like a cockroach. Raghav became popular when his audition video went viral on YouTube and was back on public demand. He received individual popularity via the show Dance India Dance 3 (2012) aired on Zee TV. At the Grand finale of DID Season 3, he was voted with 3,481,685 votes in the 2nd runner up position despite being a wildcard entrant. After DID, Raghav became the skipper of team Raghav Ke Rockstars in DID Little Masters (Season 2) where he was the only skipper to lead both of his students to the Grand finale, in which Rohan and Saumya attained 2nd and 3rd runner up positions respectively. Raghav also choreographed for Zee TV's show Dance Ke Superkids as the Captain of DID Little Masters (Season 2) team Yahoo and competed against DID Little Masters (Season 1) team Wakao - with Dharmesh Yelande as the Captain. Along with dancing he has been anchoring in various TV and stage shows. Raghav is from Dehradun, Uttarakhand. Born in a Garhwali family, he belongs to his ancestral village Khetu in Uttarakhand. An Anchor is the official host for a staged event, performance, or party. Normally, an anchor introduces speakers, makes announcements, and engages with the audience to keep the ceremony agenda flowing as smoothly as possible. "I am born in a Garhwali family from Dehradun, Uttarakhand. I am an Indian Dancer, Choreographer, Anchor and Actor. I am also known as Crockroaxz describing my dancing style which is an amalgamation of being powerful like a crocodile and creepy like a cockroach. I have hosted various TV and Stage shows." "I am born in a Garhwali family from Dehradun, Uttarakhand. I am an Indian Dancer, Choreographer, Anchor and Actor. I am also known as Crockroaxz describing my dancing style which is an amalgamation of being powerful like a crocodile and creepy like a cockroach. I have participated in various TV and Stage Dance shows."